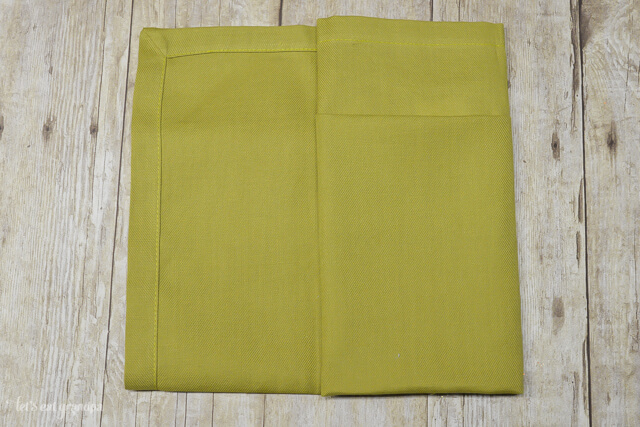 How to make customized pocket napkins! Includes folding instructions, as well as details about adding words, names, or images using an electronic cutting machine! Last week I shared some tips on how to throw a cozy, outdoor Friendsgiving. In that post, I had a set of pocket napkins that each had a word that reminded me of one of my friends. These napkins go so far beyond just Friendsgiving — they are perfect for any holiday celebration! You can add holiday words or names to use them as place cards. You could also add an image instead of words! Plus, they are super easy to make if you have a Cricut Explore. New to the Cricut Explore or Maker? I have a HUGE eCourse to help you learn! Make sure you check out my top ten reasons for getting one for Christmas at the end of this post! Start by folding your napkin so that it creates a nice pocket for your silverware. Place the napkin, right side up (so the hem and label are face-down). Fold up 1″4 of the way from the bottom. Then make another fold halfway up the napkin, making sure to keep the first fold intact. Carefully flip the whole thing over. Start folding the napkin in quarters, starting from one side. Keep folding until you have folded it all the way. Tada! Now you have a handy little pocket for your silverware. Now let’s add the personalization. Measure the size of the front of your napkin pocket. Mine was about 5″ x 7″. In the Cricut Design Space, make create a text file of this size using whatever word you want to cut. I actually made my files in Illustrator — if you do this, make sure to outline your fonts so they are readable by the Cricut Design Space. Cut out your letters. Make sure to reverse the image because these are iron-on! Here’s a great video about using iron-on if you haven’t before. Cut out the iron-on shape and weed out the negative space. Tape the shape to the front of your still-folded napkin. Then carefully unfold your napkin. Now you know exactly where to iron on the image! Using the method outlined in the video above, iron on the word or image. Then re-fold your napkin and voila! It’s perfect. These napkins are so pretty on a holiday table, and they really do add a beautiful touch of personalization. I’ve had my Cricut Explore for a whopping four months, and I already wonder how I ever crafted without it. Here’s why you should add it to your Christmas list (or get someone special to buy it for you right now!). My top reason is that you can upload your own files (jpg, png, svg) and cut any shape you can make. If you have any skill in Illustrator or photoshop, the possibilities are endless. And you can cut those files FOR FREE. Free, yo. Free. And even if you don’t have those skills, the Cricut Design Space has 25,000 images available for just $9.99 a month, or you can buy individual images. Plus there are lots of basic shapes that you can rework to create a million different designs! If you have an older Cricut, you can still use your cartridges! The Cricut Explore does so much more than cut. It also scores. It writes. It also has print-then-cut possibilities, so you can cut around shapes you’ve printed on your home printer. Super versatile. I’ll probably never cease to be amazed at the tiny shapes it can cut. It handles the tiniest cuts with the greatest ease. It can cut about a bajillion materials. In the four months I’ve had it, I’ve easily cut paper, vinyl, iron-on, fabric, felt, poster board, and wood veneer — and that’s just for a start! There’s no guessing about blade pressure or speed or any of those details. There are a TON of materials built into the machine, so you can cut without guessing! It’s the only cutting machine with an iPad app — super convenient for quick cutting! And if you’re thinking about getting a Silhouette, here are a bunch of reasons the Cricut Explore is a better choice! « Guest Bathroom Makeover Reveal! Love love love this idea! I have sewn cutlery pockets and love them but these would be so much easier. Definitely going on the hunt for some pretty linen napkins and then making these for my Easter dinner table. So glad I saw your link at the Thursday Favorite Things Party! Such a fun idea and so versatile for different party themes. Thanks for sharing at the This Is How We Roll Link Party on Organized 31. Now this is just darling! I love it! This caught my eye on Inspiration Spotlight Link up today! Love this tutorial. These are so cute! Thank you for sharing on Show Me Saturday! What a cute idea and a beautiful table setting. I love all the colors you used. 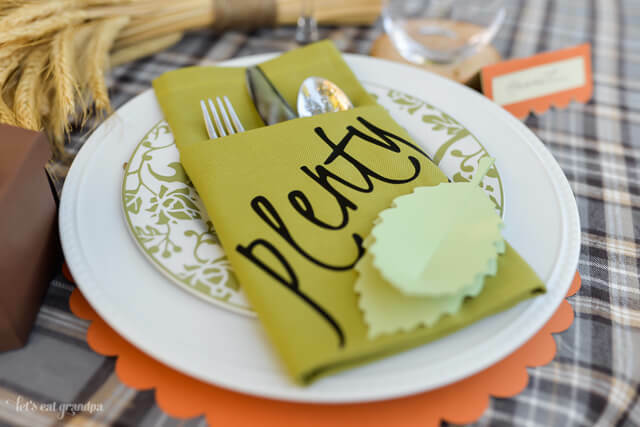 Love-love-love these customized napkins!They are perfect for any occasion. Thank you so much for the inspiration and for sharing on Show Me Saturday! I can’t wait to see what you share this weekend. You are one of my DIY project features this weekend!